Charlie Benjamin is a lot like other little kids. He wants to have friends and have fun. He loves his family. Sometimes he has has bad dreams at night. However, when Charlie has a nightmare, he doesn't just wake up scared. Charlie's nightmares open a portal to the nether, a place full of monsters that would like nothing more than to maim and terrorize humanity. Thankfully, there is the nightmare division, a secret organization charged with controlling and removing these monsters once they cross over. 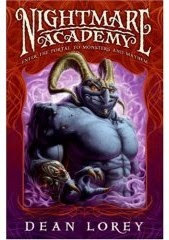 It is the job of the nightmare academy to train and prepare those who work in the nightmare division. But can Charlie learn to control his power before he releases a creature too powerful to stop? I agree completely with this review. The basic story was fun and original, and the author was actually a very good writer. But there were so many little details that were borrowed from other stories that it made the book hard to read. I would be reading along enjoying myself, and then Bamm. He would put in something borrowed from another book, and I'd think you're kidding me (actual thought). Then I would have to get into the story all over again. If the next book in the series doesn't copy any other books, then these books would probably be worth owning. He is a very good writer and should not have to use other peoples' ideas.